We’re so excited for this!!! Lots to do together!! Let’s hope the sun shines!! ALLEY WEEK 2018 is nearly here….. Playing, planting, music, slime, making, creating…. Lots of fun for everyone each day 2-4pm in the alley. ALLEY WEEK 2017 coming soon…..
We are extending Alley week this year to run over the two week half term holiday. 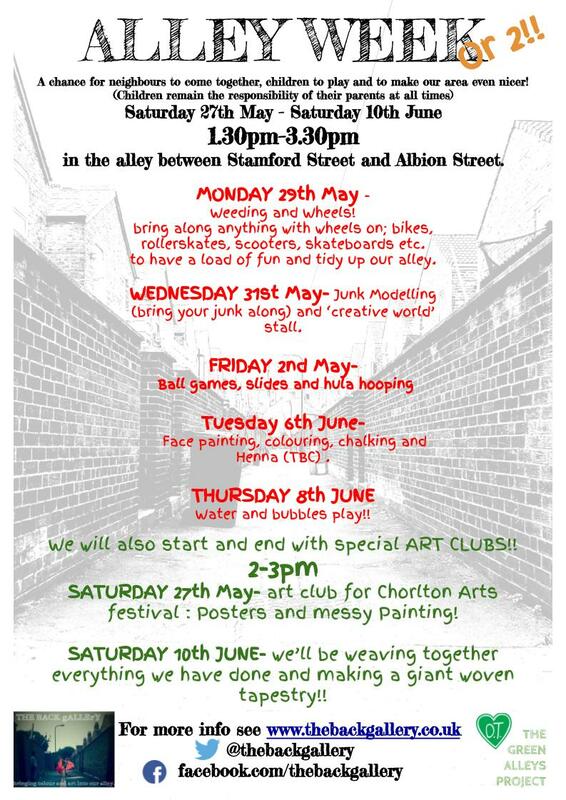 ALLEY WEEK will finish with a celebration Art Club on Saturday 10th June 2-3pm. Current planned activity ideas are Wheelie day, junk Modelling, water fight, bubbles, ball games……. MORE INFO TO FOLLOW>>>> stay tuned!!! During the Summer Half Term 2016 we hosted an Alley week in the alley between Stamford Street and Albion Street where THE BACK gALLErY is located. A different activity was facilitaed each afternoon finishing with a celebration art exhibition on Saturday. It was a great success with lots of neighbours both young and old coming out to join in the activities. The children made new friends, had lots of fun enjoying the alley as a play space and decorating some newly blackboard painted back gates with chalk drawings. Day 1. Cleaning, chalking and cake! Day 3- large scale Art. Day 5- Beach day! ending with a huge waterfight!! day 6- Celebration Art Exhibition. Thank you to St John’s Sunshine for funding this event.